I truly find happiness in an afternoon cup of tea. What I enjoy even more about my cup of tea is that it provides me with a perfect excuse to enjoy dessert in the middle of the afternoon! One of my favorite cookies is a recipe from Libya that I learned from my mother called “Kaak bil Tummar” in Arabic, which translates roughly to “cookies with dates.” The word “kaak” is plural (the double “aa” just makes a very long short “a” sound for those interested in the phonetics) and a single cookie would be “kaaka,” which I think is fun to say! It is made using slightly differing recipes across the Maghreb region of North Africa, but I prefer the Libyan recipe. But, I might be a little biased. What’s really special about these cookies is that they contain absolutely no added sugar or sweeteners because the dates provide all the sweetness you need! And with the numerous health benefits of dates and the lack of added sugar in this recipe, I consider these guilt-free cookies…so, is it really dessert? Whenever I visit home, there is always a container of these in my mama’s pantry. They have a long shelf life when stored properly, so my mama is always ready for any unexpected guests that stop by for tea. Believe it or not, that happens quite often at my parents’ house. I think it might be because her friends know that she always has an assortment of delicousness stored in containers in her pantry just waiting for an excuse to accompany impromptu tea breaks with friends. This cookie is very time intensive, especially the first time you make the recipe. The first few cookies will be a bit tricky until you master the technique of rolling the date paste into the dough. But once you get the hang of it, you’ll be rolling these out quickly. I highly suggest you halve this recipe if it is the first time you are trying it since it is a little time-consuming; otherwise, you may regret your life choices. This is also fun to do with a family member or a baking buddy/friend and will cut the labor in half! This recipe makes about 60+ cookies, so be sure to store them in an airtight container and they will last you awhile. I have had them in the pantry for up to 2 months with no issue. Mix the flour, baking powder and yeast in a large mixing bowl or a large pot with a lid. I prefer to use a pot since I can easily cover it with a lid when I set it aside to allow the dough to rise. Add the warm milk and oil to the dry ingredients. Mix well. I usually start out with a wooden spoon or spatula and then use my hand to finish kneading the dough once the dry and wet ingredients are relatively well mixed. Knead the dough well by hand for about one minute or until the dough is mixed well. The dough should have a firm, but soft consistency. Then cover the bowl or pot and set it aside to rise for a minimum of 2-3 hours to allow the dough to rise. When the dough is nearly double in size, it’s ready! Preheat your oven to 350 degrees Fahrenheit and pull out at least two cookie sheets (no need to grease them). Setup a work-station at a table (you’ll want to sit down for this) and lay out a plastic cutting board, a knife, the dough, the date paste and a cookie sheet. Take a golf-ball size piece of dough and push the center of the ball using three fingertips to make an indentation. Then take a gumball-size piece of date paste, slightly roll it into a hot-dog shape and place it into the finger indentations. Next, wrap the dough over the top of the dates as shown below. Now for the tricky part. Using one hand, roll it out to form a long rope by applying slight yet firm pressure with your fingertips and roll it back and forth until it is wide enough to use two hands. Continue rolling it until it is about the diameter of your finger. Using a knife, make diagonal cuts along the entire edge of the dough/date piece and then cut the ends at a diagonal. Take the dough/date piece and form a circle and line up the diagonal edges and push together. Place it on a baking sheet and continue to make more kaak until the pan is full. Place the kaak as close together as you like without them touching; feel free to crowd the pan. Once your pan is full, brush the top of each kaaka with egg yolk and sprinkle with a mixture of white & black sesame seeds. 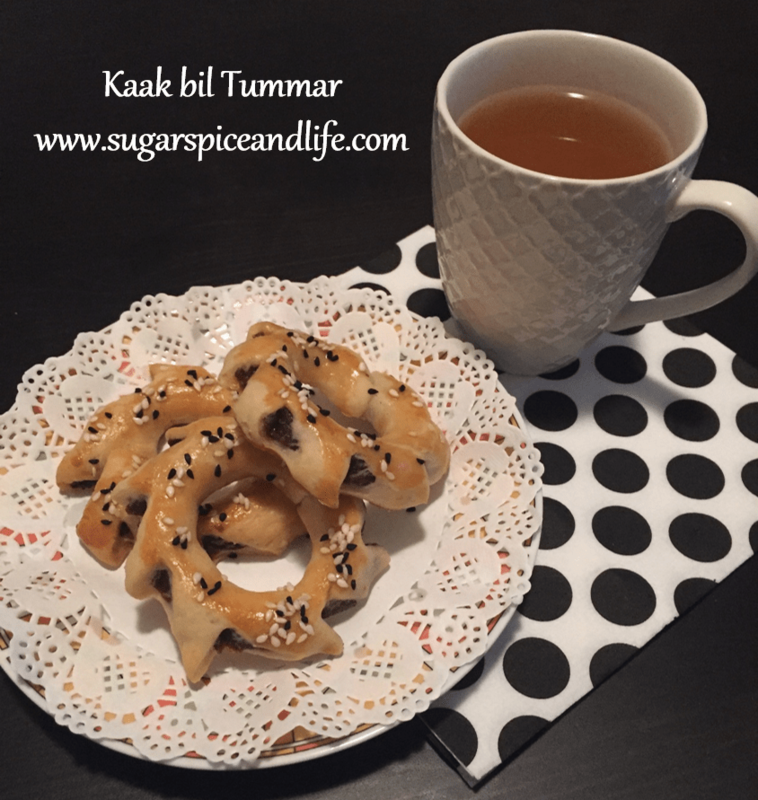 Fun fact: Libyans love putting black sesame seeds on nearly all baked goods due to their health benefits, which were also mentioned in Islamic texts from over 1,400 years ago! But if you don’t have any on hand, just use white sesame seeds. Place the baking sheet in the center of the oven and bake for 25-30 minutes, until golden brown. Once they have cooled, store them in an airtight container. I hope you enjoy these as much as I do with a cup of tea or a cappucino. Please let me know how they turned out for you in the comments! A Libyan cookie stuffed with dates that pairs well with tea and coffee. And it's sugar-free! Mix the dry ingredients together. Then add the oil and warm milk and mix well. Cover the bowl with foil and allow it to rest for 2-3 hours so it can rise. Take a golf-ball sized piece of dough and push the center of the ball using three fingertips to make an indentation. Then take a gumball-size piece of date paste, slightly roll it into a hot-dog shape and place it into the finger indentations. Wrap the edges of the dough over the top of the dates and then roll it out to form a long rope. Using a knife, make diagonal cuts along the edge of the dough/date piece and then cut the ends off at a diagonal. Take the dough/date piece and form a circle by lining up the diagonal edges and gently pushing them together. Place the cookie on an ungreased baking sheet and repeat until the pan is full of cookies. Then brush the tops of the cookies with an egg yolk and sprinkle with sesame seeds. 4. Place the baking sheet in the center of the oven and bake for 25-30 minutes, until golden brown. Once they have cooled, store them in an airtight container. I think this is our family favorite cookie! 🙂 I have nostalgia every time I eat one, lol. Can you use this same dough recipe for regular kaak without the date filling? You probably could use the same dough, if you add 1 teaspoon of salt assuming you want Kaak Malih. In a large bowl, combine flour, yeast and sesame and mix altogether. Add in the oil and mix once more. In a separate cup, dissolve salt into the warm water and add to the mixture. Cover the bowl with foil and allow to rise for 2 hours. Once the dough is ready, take a piece and roll it and form a circle. Cut slits on the side and place on a baking sheet. Repeat with all the dough. Bake at 350 for 25-30 minutes or so. Inshallah it turns out well for you. Eid Mubarak! Looks great! I love cookies!